Thinking of trying surfing? or just looking to try a new location to test your skills? Well Costa Rica should be at the top of your list for places to go. Not only does it have some of the best surfing in the world, you can enjoy it in a tropical paradise. If you planning on a surfing Costa Rica there are surf camps all along the coasts to choose from. If your just looking to try it for something new, you will have plenty of choices to take a introductory lesson. Be careful, surfing can be additive. Most of the best surfing spots in Costa Rica are found along the western coastline. The Pacific Ocean to the west provides more consistent surf than the Caribbean Sea to the east. However, the Caribbean coastline does have a short surfing season every year which sees large swells from tropical storms off Mexico. Because Costa Rica is a popular destination for surfers, you’ll find surf camps all along the coastline, plus surfer friendly accommodation and specialist stores in many towns. There are lots of popular surfing beaches in Costa Rica offering waves to suit beginner, intermediate, and advanced level surfers. And you will also find a good variety of wave types, including point break, reef break, beach break, and river mouth. The importance of the different wave shapes is explained below in the Surfing 101 section of this article. For the beginner, beaches where the waves are beach breaks are considered best because such waves are relatively gentle and the seabed less dangerous during a wipe out. Looking to try surfing in Jaco? 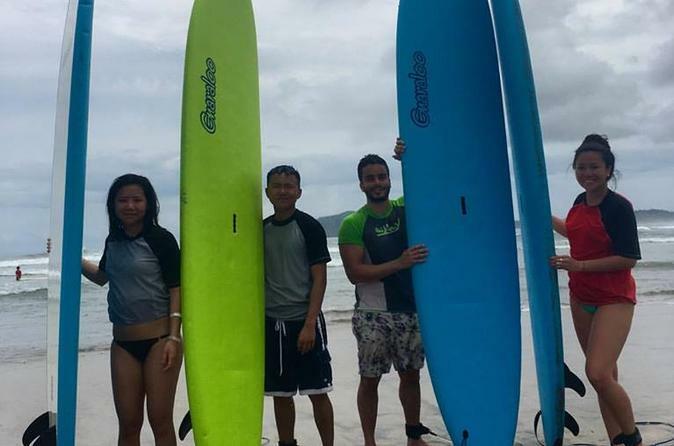 This 2 hour surfing lesson with a professional instructor will give you the basics to see if its for you. All equipment is provided, even hotel pickup! You will learn how to stand on the board, how to paddle and pick a wave. The instructors will push you to make it easier for you to catch a wave and help you get your form down so you can stand on the board. If you have some experience already, they will take you out past the breakers and help you choose the right wave to surf. Jaco is well known to be one of the best Costa Rica surf towns, you are sure to enjoy your stay here. Experience surfing Costa Rica almost completely to yourself in Playa Linda and Matapalo Beach. These beaches are almost empty so you can learn to surf without having to worry about competition for waves. After being picked up from your hotel you will either go to Playa Linda and Matapalo Beach depending on conditions and time of day. This is a full day experience of not just learning how to surf but an all day adventure of bodyboarding, relaxing in a hammock and beach games. This is perfect if you go with a companion who is not interested in trying surfing. You will learn all the surfing basics from a local instructor, by the end of the day you should be able to stand on a board and surf! Looking to all in and learn how to surf? Well this is one of the best surf camps costa rica! This all-inclusive 8-day, 7-night surf camp is designed for experienced surfers or wanna be surfers who have never been on a board. You will have 9 two hour surfing lessons, plus 3 trips trips to other beaches to ride some different waves. This is not just a surfing, you will get a full immersion in Costa Rica with a volcano tour, a snorkel or scuba diving trip and authentic Costa Rican food. The comfortable accommodations include a queen sized bed, AC, private bathroom and laundry service. By the end of of the week so should have all the basics down and be able to call yourself a “surfer”. If you have seen the movie ‘The Endless Summer’ you will probably recall seeing Tamarindo. One of the premier places to learn how to surf with its almost perfect waves. Even if you have never been on a surf board these lesson are perfect for you. This 2 hour lesson you will learn the basics in a small group, no more than 4 people. Your local professional will focus on surfing safely, etiquette, paddling techniques, popping up, positioning on the board, board stance and how to read Waves. This surf school has been in business for 25 years. Located directly in front of the beach break in Tamarindo you’ll be taught the basics from paddling out past the break, all the way to catching the best waves in a set. They have taught tens of thousands of students in a bi-lingual setting with complete safety-trained instructors. All new equipment and full-insured. Discounted board rentals with lessons. Tamirindo is one of the best surfing beaches in Costa Rica. Pura Vida! Witches Rock was featured in the movie “Endless Summer II” and is one of the best surf spots in Costa Rica. If you go here you are almost guaranteed an uncrowded experience because the only way to get there is an hour long boat ride. Located in the beautiful Santa Rosa National Park in the Gulf of Papagayo it is definitely worth the trip! This is not a instruction tour, you will need to know some of the basics. With 330 days on average of perfect waves it is one of the best bets for good surfing conditions. Conditions are best from November to August, so plan accordingly. The above are just a small selection of the many locations where you can surf in Costa Rica. With such an extensive coastline and a low population level, you’ll find many completely empty beaches that have ideal locations to surf. That’s one of the many reasons why Costa Rica is such a great place to go surfing. Costa Rica literally means “rich coast” and is world renowned for having some of the best surfing in the world. One great aspect of this country’s geography is that it boasts a lot of beautiful coastline relative to its size. It also has beaches facing the Pacific Ocean and the Caribbean Sea offering different surfing experiences. Being a small country, you’ll be happy to discover that everything is surprisingly close together. Because Costa Rica has a tropical climate, you will have great weather for surfing with no need for a wet suit. The water temperature hovers around 78oF all year long. You’ll be interested to know that Costa Rica is recognized by many enthusiasts from all around the world as one of the best places for Costa Rica surf vacations. This is largely because you can always find somewhere in this small nation with great waves at any time of the year. There are quite a few reasons you might want to visit this intriguing country. Did you know that Costa Rica has no standing army and houses the United Nations University for Peace? Perhaps that’s why it is considered by one of the world’s happiest country. Or maybe it’s because of the exceptionally high life expectancy of 79 years. If you are interested in nature, you’ll be delighted to learn that Costa Rica boasts 5% of the world’s biodiversity, even though its a tiny country. Approximately a quarter of the land is part of a reserve or protected forest. There are 52 species of hummingbirds, and in the Monteverde cloud forest, you’ll discover 500 varieties of orchid. There many rare birds, including quetzals—a bird sacred to the Mayans who valued their feathers above gold. You can even see turtle eggs hatch on some beaches along the Pacific coast. The Costa Rica surf season is December to April. That is because this is the “dry” season. The remaining months experience very heavy rainfall. For this reason, you may find that airfares and hotel rates are cheaper during this “green” season. Since you aim to get wet anyway, you might not be bothered about the rain. However, if you are with someone who is not a surfer or want to get in some sightseeing, keep in mind that some sites may be closed during the green season and visibility can be poor in the rain. On the Pacific coastline, the clean surf appears from December to April, tying in with the dry season, but there’s also a major swell season from April to October. On the Caribbean coastline, the best surfing is found from January to April. The next few years are likely to see a huge surge in the popularity of surfing as it becomes an official Olympic sport in the 2020 Summer Olympics in Tokyo. The earliest origins of surfing are lost in prehistory, but the modern sport owes much to the ancient Hawaiian people, who regarded surfing as more of an art than a sport. The earliest surfboards were made from wood, but these were heavy and larger than a typical modern board. Most modern boards are constructed using fiberglass foam with wooden strips. Other materials are sometimes used, such as expanded polystyrene foam. Modern boards are much lighter and easier to handle than their Hawaiian ancestors. There have been quite a few design innovations, such as a fin (skeg) for better tracking, a leash so your board doesn’t get away from you, and wax to improve traction on the board. Surfing is fun and challenging that can take years to perfect and if you don’t know what your doing you can get seriously injured. Whether you plan to hit the surf in Costa Rica or somewhere else, it is essential for you to understand the basics. Not just to get the most out of your holiday and to ensure your safety. If you are a complete beginner, don’t try and learn by yourself. Costa Rica has plenty of good tour operators who will be able to arrange introductory lessons by an experienced and qualified instructor, either on an individual basis or in groups. Your instructor will probably recommend that you use a soft board to begin with because they are durable and buoyant. As a rule of thumb, the longer the board the better for the novice surfer because the larger the volume of the board the easier it is to balance and paddle into waves. Most initial lessons begin on dry land with a safety briefing followed by practice on your board while its on the ground. This allows the beginner to get used to the feel of their surfboard before hitting the waves.It may seem unnecessary but you shouldn’t go out until you’ve practiced a little on the sand. Once you’re out on the water, getting up from lying on the board to standing (“taking off” or “popping up”) is actually pretty tricky. This is a technique that you’ll want to practice on dry land first. From lying on your stomach, place your hands palm down on the board below your chest while your fingers are curled over the surfboard’s sides. Then use your arms to push up your body while tucking your knees under you into a kneeling position. From kneeling, bring up your leading foot and place it where your palms were, and then position your other foot a shoulder’s width back. When you’ve gained confidence popping up, you can perform the maneuver in one fluid motion, without the pause to kneel. If you feel your hands and feet slipping during this process, your surfboard probably needs more wax. Leading with the left foot is termed “regular foot” and with the right “goofy foot”. Which foot you lead with is a personal preference, but right handed people often feel more comfortable leading with their left foot, and left handed with their right foot. Once standing, you’ll want to keep your knees bent, arms extended and loose, feet firm on the board, and your torso leaning forward. It’s important to keep looking in the direction you’re headed. After only a few lessons, you will find your confidence and skill improved sufficiently for you to tackle easy waves. When you hit the beach by yourself, be aware that over the years some rules of surfing etiquette have evolved. One important thing to do so that you do not upset your fellow surfers is to observe right of way. There is a concept called “wave priority”. This is all about not being selfish out on the water and sharing the waves with other surfers. In a nutshell, the person closest to the breaking part of a wave is given priority. If a surfer has popped up and is riding a wave, then that wave is theirs. But if you are a faster paddler than everyone else on that beach, then you should not use this to claim every wave in front of other people. That would only upset a lot of other surfers. Share and share alike so that everybody around you is happy. Happy surfers are more likely to share their local knowledge with you—warning you about safety issues, telling you where you can buy the cheapest equipment, and even recommending good restaurants where you can try out the local cuisine. Once you’re ready to surf, you should be aware that there are different kinds of wave, and each gives you a different surfing experience. Point break waves are ideal for surfing. They form when ocean waves hit a rocky outcropping of land and transform into a nice, peeling wave. In fact the movie “Point Break” with Patrick Swayze and Keanu Reeves was named after this kind of wave. The relatively long and predictable nature of these waves makes them great for intermediate to advanced surfers to perfect their style and practice maneuvers. Reef break waves are those shaped by the passage of ocean waves over a coral reef. These are the aesthetically pleasing kind of wave that you will see in aftershave adverts featuring athletic looking surfers. They can give an experienced surfer a great ride, but are dangerous during a bad wipe out because of the solid and often sharp nature of the seabed. 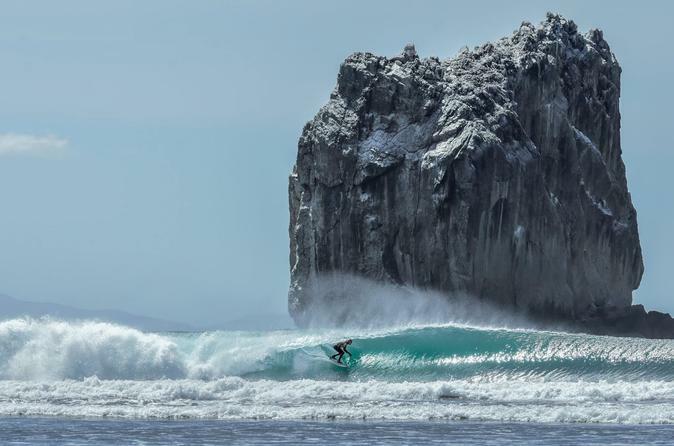 Some of the world’s largest waves break over reefs. Reef breaks are for more advanced surfers. Beach break waves are created when ocean waves break on sandy seabeds. This shape of wave is considered by many to be the best for beginners to learn on. The waves tend to be long and gentle. Beach breaks are safer than reef breaks because the sandy bottom with not cut you like the reef will. River mouth waves form where river mouths have caused a sandbar to develop which cause waves to peel in a predictable and tidy manner. They have some similarity to point breaks. You should get as much advice as possible from your tour company about how to prepare and what to bring along with you before setting off to Costa Rica. Remember. Don’t be over confident. Stay safe. The most obvious danger is drowning. For this reason, if you are not an experienced swimmer then you should consider taking refresher lessons at your local swimming pool before your holiday so that you are prepared for the event you lose your board. For your own safety, if you are an inexperienced surfer start in gentler surf. Take baby steps toward more challenging conditions. If you choose a spot that is above your ability, you may also upset other surfers because you’ll get in their way and also become a potential hazard for them all. Popular surfing destinations should have professional life guards patrolling the beach. If you are not a strong swimmer then try and choose where help is never too far away. Another danger is collision, either with your own surfboard when you fall off or by another surfer, or reefs and sand bars under the water. Be smart when choosing where to surf. Get advice from local instructors or other surfers as to where the hidden dangers are under the water, and try not to surf too close to others where possible. Be aware of rip currents, a rip current is a channel of water that flows away from the shore and can therefore carry you far out to sea. The trick to leaving a rip current is paddling parallel to the shore rather than trying to fight against the current and paddle toward shore. Where rip currents are common, there may be warning signs. A good tour company/surf camp will provide you with all the local information you need so that you can avoid these dangers. 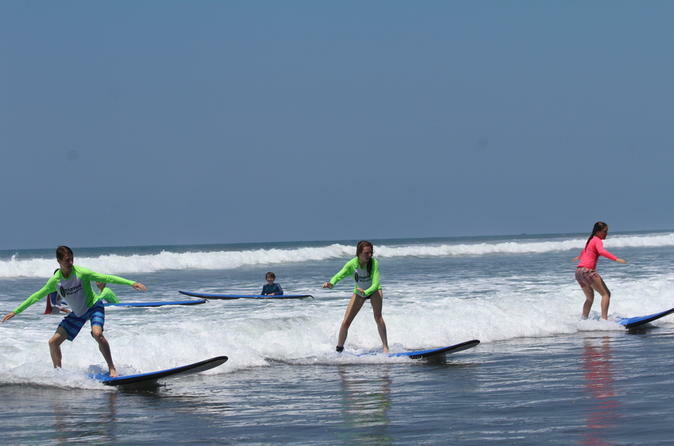 They may also provide you with equipment and basic lessons so that you are prepared for safe surfing. Your surfboard should have a leash so you don’t lose your board, traction pads to prevent your feet slipping, and a fin for better tracking. Waxing your board with surfboard wax will also improve traction to help prevent slipping. Wear the right clothes for the location and conditions. Your tour company should be able to provide good advice on what you will need before you fly out there. Costa Rica is one of the prime surfing destinations on the planet, and a marvelous place to observe Mother Nature. If you are serious about learning how to surf, you won’t find a better location to take lessons and enjoy all the thrill of riding waves than Costa Rica.